Doi Mae Salong (Thai: ดอยแม่สลอง) is a place with a very interesting history. It is also one of my favourite places in Thailand. 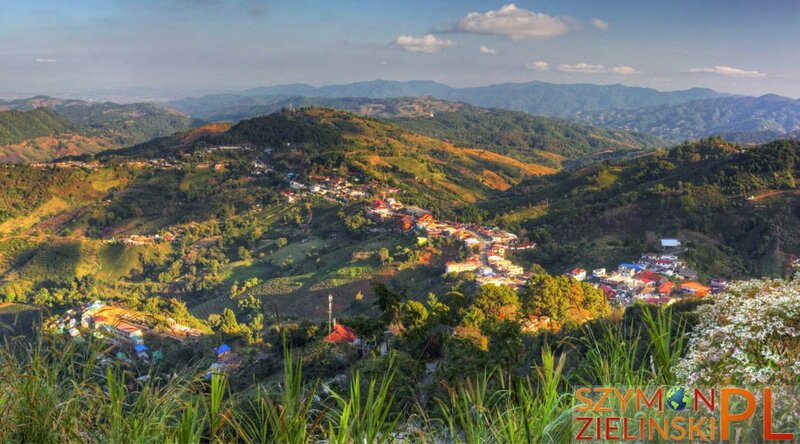 The official name of the village is Santikhiri (สันติคีรี), but it is located on a hill called Mae Salong (“doi” means mountain in Thai). I mentioned the interesting history of the place. The early days of Doi Mae Salong go back to the time of opium trade in the Golden Triangle. The Golden Triangle was the name of the area where three countries border each other – Thailand, Myanmar (Burma) and Laos – and it was infamous for drugs trade. The following history was adopted from Mae Salong’s Wikitravel website (here). In 1949, after the Nationalist Kuomintang government was formed, 93rd Division of the Chinese Nationalist Army refused to surrender to Chinese communists. Unlike most of the unrelenting nationalists that fled to Taiwan in 1949, a force of 12,000 escaped from Yunnan to Burma and continued an insurgency against the Peoples’ Republic. They were at first supported by Taiwan and the USA, but diplomatic shifts later led to the partial disbanding of the nationalist forces in Burma. While thousands left for Thailand in 1961, many remained in Burma. In the 1970s the Thai government struck a deal with the renegades: the battle-hardened soldiers would help them fight Thailand’s own communist insurgents in exchange for legitimacy and Thai citizenship. Part of their going straight involved the soldiers’ cessation of opium production in favour of the cultivation of mushrooms and above all oolong tea (a kind of between green and black tea, with the green being more dominant), which is now Mae Salong’s main product. The tea plantations can be spotted at almost every hill and valley in the area. The road to Mae Salong is very windy and sometimes steep, yet usually very well constructed, which makes it seem actually pretty easy. Bear in mind that it doesn’t mean it is completely safe at all, as we have witnessed ourselves – but more about that later. Probably the most famous place in Doi Mae Salong is Phra Boromathat Chedi, stupa built in honour of the Princess Mother, Srinagarindra. Next to the chedi is the Princess Mother Hall, a modern, Thai-style pavilion looking similar to a temple on the outside. There are two ways leading to the stupa – one on your feet, through 719 steep stairs (on photos) and very steep and windy paved road coming from the other end of Mae Salong (you can see the steep end of this road on the photos as well). Other places worth mentioning are Tomb of General Tuan, the founder of Mae Salong, and Chinese Martyrs’ Memorial Museum (ticket: 20 baht, about 0.5 euro, in 2013). Museum is rather modest and its purpose is to keep the memory of soldiers that died during the fights against communism. What is most breathtaking, are the views. Beautiful panorama can be seen especially from Phra Boromathat Chedi – from there you can also see the overwhelming tea plantations. It is definitely worth staying here for one night. During my last visit, it was a time of Tea Festival, Sakura Blossom and Several Tribes culture (not perfect name in English, but hey – this is Thailand). There was a procession of hill tribe members (living in the proximity) dressed in traditional clothes that walked through the length of the village. There was also a big marketplace and a large stage, where one could admire the shows of local folklore. Mae Salong was founded by Chinese people from Yunnan province and therefore is a perfect opportunity to try the Yunnanese cuisine. Personally I love Yunnanese beef curry served with mantou (Chinese steamed bun without filling). Salapao (Chinese steamed buns with fillings) are also well worth trying. On the way back we witnessed a scene of an accident – the truck has stopped on the tree growing at a turn. It is not something you can see every day. So much about the road safety. Before arriving in Chiang Rai town, we briefly stopped at Pong Nam Ron hot springs. At that time they were still under construction, the only ready things were places for dipping feet and ponds for boiling eggs. The photos come again from many trips to Doi Mae Salong so do not be deceived by my constantly changing look. On the way from Tha Ton. Doi Mae Salong, Chiang Rai province, Thailand. Po drodze z Tha Ton. Doi Mae Salong, prowincja Chiang Rai, Tajlandia. View of the Mae Salong surroundings. Doi Mae Salong, Chiang Rai province, Thailand. Widok na okolice Mae Salong. Doi Mae Salong, prowincja Chiang Rai, Tajlandia. Tea break at one of the many tea shops. Doi Mae Salong, Chiang Rai province, Thailand. Przerwa na herbatę w jednym z wielu sklepów. Doi Mae Salong, prowincja Chiang Rai, Tajlandia. Phra Boromathat Chedi. Doi Mae Salong, Chiang Rai province, Thailand. Phra Boromathat Chedi. Doi Mae Salong, prowincja Chiang Rai, Tajlandia. 719 steps leading to Phra Boromathat Chedi. Doi Mae Salong, Chiang Rai province, Thailand. 719 schodów prowadzących do Phra Boromathat Chedi. Doi Mae Salong, prowincja Chiang Rai, Tajlandia. Small animals we encountered on the steps to Phra Boromathat Chedi. Doi Mae Salong, Chiang Rai province, Thailand. Małe zwierzątka, na jakie natknęliśmy się na schodach prowadzących do Phra Boromathat Chedi. Doi Mae Salong, prowincja Chiang Rai, Tajlandia. The steep road leading to Phra Boromathat Chedi. Doi Mae Salong, Chiang Rai province, Thailand. Stroma droga prowadząca do Phra Boromathat Chedi. Doi Mae Salong, prowincja Chiang Rai, Tajlandia. The view from Phra Boromathat Chedi. Doi Mae Salong, Chiang Rai province, Thailand. Widok z Phra Boromathat Chedi. Doi Mae Salong, prowincja Chiang Rai, Tajlandia. Inside Phra Boromathat Chedi. Doi Mae Salong, Chiang Rai province, Thailand. Wewnątrz Phra Boromathat Chedi. Doi Mae Salong, prowincja Chiang Rai, Tajlandia. Princess Mother Hall, located just next to Phra Boromathat Chedi. Doi Mae Salong, Chiang Rai province, Thailand. Pawilon Księżniczki Matki, wybudowany tuż obok Phra Boromathat Chedi. Doi Mae Salong, prowincja Chiang Rai, Tajlandia. The view from Phra Boromathat Chedi. Wild Mexican sunflowers in the full bloom in the foreground. Doi Mae Salong, Chiang Rai province, Thailand. Widok z Phra Boromathat Chedi. Dzikie meksykańskie słoneczniki w pełnym rozkwicie na pierwszym planie. Doi Mae Salong, prowincja Chiang Rai, Tajlandia. Tomb of General Tuan, the founder of Mae Salong. Doi Mae Salong, Chiang Rai province, Thailand. Grobowiec generała Tuan, założyciela Mae Salong. Doi Mae Salong, prowincja Chiang Rai, Tajlandia. The view on a tea plantation as seen from the tomb of General Tuan. Doi Mae Salong, Chiang Rai province, Thailand. Widok na plantację herbaty, obok grobowca generała Tuan. Doi Mae Salong, prowincja Chiang Rai, Tajlandia. One of the many tea shops. Doi Mae Salong, Chiang Rai province, Thailand. Jeden z wielu sklepów z herbatą. Doi Mae Salong, prowincja Chiang Rai, Tajlandia. Me at one of the tea plantations. Doi Mae Salong, Chiang Rai province, Thailand. Ja na jednej z plantacji herbaty. Doi Mae Salong, prowincja Chiang Rai, Tajlandia. Insect at one of the tea plantations. Doi Mae Salong, Chiang Rai province, Thailand. Insekt na jednej z plantacji herbaty. Doi Mae Salong, prowincja Chiang Rai, Tajlandia. Street market at Doi Mae Salong, Chiang Rai province, Thailand. Przydrożny targ w Doi Mae Salong, prowincja Chiang Rai, Tajlandia. Me at the big 0 km marker. Doi Mae Salong, Chiang Rai province, Thailand. Ja przy wielkim znaczniku zerowego kilometra. Doi Mae Salong, prowincja Chiang Rai, Tajlandia. Me eating salapao (Chinese steamed bun with filling) for breakfast. Doi Mae Salong, Chiang Rai province, Thailand. Ja jedzący salapao (chińskie nadziewane kluski na parze) na śniadanie. Doi Mae Salong, prowincja Chiang Rai, Tajlandia. Market at Doi Mae Salong, Chiang Rai province, Thailand. Targ w Doi Mae Salong, prowincja Chiang Rai, Tajlandia. Chinese Martyrs’ Memorial Museum. Doi Mae Salong, Chiang Rai province, Thailand. Muzeum Pamięci Chińskich Męczenników. Doi Mae Salong, prowincja Chiang Rai, Tajlandia. Inside Chinese Martyrs’ Memorial Museum. Doi Mae Salong, Chiang Rai province, Thailand. Wnętrze Muzeum Pamięci Chińskich Męczenników. Doi Mae Salong, prowincja Chiang Rai, Tajlandia. Yunnanese cuisine – excellent Yunnanese beef curry. Doi Mae Salong, Chiang Rai province, Thailand. Potrawy z prowincji Yunnan – doskonałe curry z wołowiną. Doi Mae Salong, prowincja Chiang Rai, Tajlandia. Yunnanese cuisine. Doi Mae Salong, Chiang Rai province, Thailand. Potrawy z prowincji Yunnan. Doi Mae Salong, prowincja Chiang Rai, Tajlandia. Our dinner. Doi Mae Salong, Chiang Rai province, Thailand. Nasza kolacja. Doi Mae Salong, prowincja Chiang Rai, Tajlandia. Fried rice. Doi Mae Salong, Chiang Rai province, Thailand. Podsmażony ryż. Doi Mae Salong, prowincja Chiang Rai, Tajlandia. Mantou (Chinese steamed bun, no filling). Doi Mae Salong, Chiang Rai province, Thailand. Mantou (chińskie kluski na parze bez nadzienia). Doi Mae Salong, prowincja Chiang Rai, Tajlandia. Market at Tea Festival. Doi Mae Salong, Chiang Rai province, Thailand. Targ podczas Festiwalu Herbaty. Doi Mae Salong, prowincja Chiang Rai, Tajlandia. People from hill tribes are dancing during the Tea Festival. Doi Mae Salong, Chiang Rai province, Thailand. Ludzie z plemion górskich tańczą podczas Festiwalu Herbaty. Doi Mae Salong, prowincja Chiang Rai, Tajlandia. Kids wearing traditional hilltribe costumes during the Tea Festival. Doi Mae Salong, Chiang Rai province, Thailand. Dzieci ubrane w tradycyjne stroje plemion górskich podczas Festiwalu Herbaty. Doi Mae Salong, prowincja Chiang Rai, Tajlandia. Big swing for 4 people at the Tea Festival. Doi Mae Salong, Chiang Rai province, Thailand. Wielka huśtawka dla 4 osób podczas Festiwalu Herbaty. Doi Mae Salong, prowincja Chiang Rai, Tajlandia. Tea Festival Parade. Doi Mae Salong, Chiang Rai province, Thailand. Parada podczas Festiwalu Herbaty. Doi Mae Salong, prowincja Chiang Rai, Tajlandia. Stage performances during the Tea Festival. Doi Mae Salong, Chiang Rai province, Thailand. Przedstawienia na scenie z okazji Festiwalu Herbaty. Doi Mae Salong, prowincja Chiang Rai, Tajlandia. Guardian of the tea plantation. Doi Mae Salong, Chiang Rai province, Thailand. Strażnik plantacji herbaty. Doi Mae Salong, prowincja Chiang Rai, Tajlandia. Panoramic view of the tea plantation. Doi Mae Salong, Chiang Rai province, Thailand. Panoramiczny widok na plantację herbaty. Doi Mae Salong, prowincja Chiang Rai, Tajlandia. Giant swing, next to the tea plantation. Doi Mae Salong, Chiang Rai province, Thailand. Wielka huśtawka, przy plantacji herbaty. Doi Mae Salong, prowincja Chiang Rai, Tajlandia. Tea plantation. Doi Mae Salong, Chiang Rai province, Thailand. Plantacja herbaty. Doi Mae Salong, prowincja Chiang Rai, Tajlandia. Decorations at the tea plantation. Doi Mae Salong, Chiang Rai province, Thailand. Oczko wodne przy plantacji herbaty. Doi Mae Salong, prowincja Chiang Rai, Tajlandia. Me and the decorations at the tea plantation. Doi Mae Salong, Chiang Rai province, Thailand. Ja i oczko wodne przy plantacji herbaty. Doi Mae Salong, prowincja Chiang Rai, Tajlandia. Giant tea pot at the tea plantation. Doi Mae Salong, Chiang Rai province, Thailand. Wielki dzbanek na herbatę przy plantacji herbaty. Doi Mae Salong, prowincja Chiang Rai, Tajlandia. Me at the tea plantation. Doi Mae Salong, Chiang Rai province, Thailand. Ja na plantacji herbaty. Doi Mae Salong, prowincja Chiang Rai, Tajlandia. Me jumping at the tea plantation. Doi Mae Salong, Chiang Rai province, Thailand. Skaczący ja na plantacji herbaty. Doi Mae Salong, prowincja Chiang Rai, Tajlandia. Me jumping (again) at the tea plantation. Doi Mae Salong, Chiang Rai province, Thailand. Skaczący (ponownie) ja na plantacji herbaty. Doi Mae Salong, prowincja Chiang Rai, Tajlandia. Me jumping (I just love it) at the tea plantation. Doi Mae Salong, Chiang Rai province, Thailand. Skaczący ja (po prostu to uwielbiam) na plantacji herbaty. Doi Mae Salong, prowincja Chiang Rai, Tajlandia. Ma at the tea plantation. Doi Mae Salong, Chiang Rai province, Thailand. Guardians of the tea plantation. Doi Mae Salong, Chiang Rai province, Thailand. Strażnicy plantacji herbaty. Doi Mae Salong, prowincja Chiang Rai, Tajlandia. Crashed truck on the way down. Doi Mae Salong, Chiang Rai province, Thailand. Zmasakrowana ciężarówka na drodze w dół. Doi Mae Salong, prowincja Chiang Rai, Tajlandia. View near the crashed truck. Doi Mae Salong, Chiang Rai province, Thailand. Widok obok miejsca wypadku ciężarówki. Doi Mae Salong, prowincja Chiang Rai, Tajlandia. Me and the view of the Mae Salong surroundings. Doi Mae Salong, Chiang Rai province, Thailand. Ja i widok na okolice Mae Salong. Doi Mae Salong, prowincja Chiang Rai, Tajlandia. Pong Nam Ron hot springs, on the way from Mae Salong to Chiang Rai. Pond for boiling eggs. Pong Nam Ron, Chiang Rai province, Thailand. Gorące źródła Pong Nam Ron, po drodze z Mae Salong do Chiang Rai. Basenik do gotowania jajek. Pong Nam Ron, prowincja Chiang Rai, Tajlandia. Pong Nam Ron hot springs on the way from Mae Salong to Chiang Rai. Pong Nam Ron, Chiang Rai province, Thailand. Gorące źródła Pong Nam Ron, po drodze z Mae Salong do Chiang Rai. Pong Nam Ron, prowincja Chiang Rai, Tajlandia.